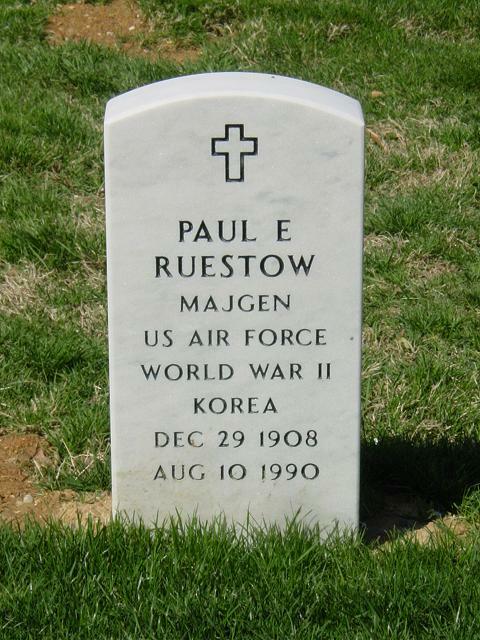 Paul E. Ruestow was born, the second of five children, in Rockville Center, Long Island, New York, in 1908. He graduated from Lynbrook, Long Island, High School in 1926. He received a Congressional appointment to the U.S. Military Academy and entered the academy in the fall of 1926. He graduated eighth in the class of 1930 and was commissioned a second lieutenant in the Corps of Engineers. His first assignment was Engineer Corps Officer on River & Harbor Duty in New York City. His duties were to improve navigable waterways around New York City and New Jersey. In 1932 he attended the Princeton Graduate School of Engineering, where he received the degree of civil engineer and was elected to the honorary engineering research society of Sigma Zi. From 1933 to 1935 Lieutenant Ruestow had his first troop duty as company commander and regimental adjutant of the First Combat Engineers at Fort Dupont, Del. In the spring of 1935 he attended a two weeks' ground school conducted by the Air Corps at Mitchel Field, N.Y., for officers of other branches. Soon after he applied for admission to flying school, was accepted, and entered school at Randolph Field, Texas, in September 1935. He graduated at Kelly Field in 1936 and was assigned to bombardment. Lieutenant Ruestow's first Air Corps assignment was to Luke Field, Hawaii, where he was with the 72nd Bombardment squadron. that day. This led to his work in 1942 in developing mobile technical units used in World War II, followed by his assignment to Headquarters U.S. Air Force and the Joint Chiefs of Staff. In November l944 Colonel Ruestow went to England with the War Department Gasser Manpower Board to France as deputy commander Air Technical Service Command Europe and eventually to Wiesbaden as U.S. Air Forces in Europe. Colonel Ruestow was awarded the Legion of Merit for his work on mobile technical units and an oak leaf cluster for his work in Europe. On his return from Europe in 1947 Colonel Ruestow went to the Deputy Chief of Staff/Materiel Headquarters U.S. Air Force as assistant for Logistics Plans and Assistant for Materiel Program Control. He attended the National War College in 1948 and 1949 and served as Air Force member of the Joint Logistics Plans Committee in the Joint Chiefs of Staff. In May 1952 Brigadier General Ruestow became commander of the Far East Air Materiel Command with headquarters at Tachikawa, Japan. During his three and a half years there, his command supported the U.S. Air Force and U.N. forces in Korea, maintained equipment in the war in Indo-China, and deployed American forces and equipment to Formosa. He came in close contact with all our allies in the Far East, Japan, Korea, Nationalist China, the Philippines, Thailand, Indo-China and Australia. He worked constantly to improve our relations with them and to build up their aviation industry capability to support our military operation. He received the Distinguished Service Medal and the Order of the British Empire for his work in the Far East. In l952 he returned to the United States and was assigned as director of Personnel and Support Operations at Headquarters Air Materiel Command at Wright-Patterson Air Force Base. Golf has always been an absorbing interest, starting with a summer caddying job as a young boy on the West Point golf team, and continuing now wherever he happens to be all over the world; shoots in the 80s. Enjoys chess, bridge and gin rummy. Dislikes night life, and when not at work or on the golf course, prefers to be home. Director of American Social Hygiene Association; Shriner. Likes seafood and rare beef. Very conservative as to clothes - prefers to wear jacket and tie. Likes to read history; doesn't have enough time for fiction. Likes classical music of the lighter variety, especially Chopin. Has traveled extensively in both Europe and the Far East and enjoyed all of it. "You've got to be flexible"; "Master the fundamentals". Demands honesty and real effort - has no patience with laziness or complainers. Emphasizes physical fitness and has promoted athletic programs in his commands. In Japan all his FEALOGFOR teams excelled in competition, the football team winning the Far Eastern championship. Rather quiet; does not talk unless he has something of value to contribute. Dislikes the too-glib talker and the smart-alec. Detects insincerity immediately. His work comes before all personal considerations. Is very conscientious and a hard worker, but knows the value of delegating responsibility to his subordinates. "He has a mind like a steel trap". In 1957 was chief of Department of Defense Technical Mission to Australia. Once flew into a hay stack. Sees the humor now - he didn't then. of Supply and General Clay, later commander in Europe, and is one of the few who made the round-the-clock non-stop flight with Quantas from Perth to Ceylon in the Cataline twin engine aircraft. He was host to President-elect Eisenhower on his visit to Iwo Jima; he took part in Operation Handclasp II in Australia; he was made an honorary pilot of the Thailand Air Force; and was presented the key to the City of Tokyo. General Ruestow was buried with full military honors in Section 59, Grave 447, Arlington National Cemetery.